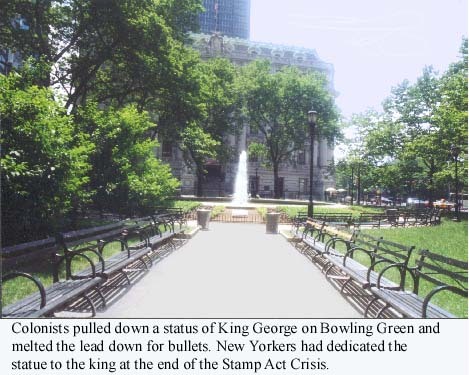 Bowling Green was the site of a statue of King George III, erected by the grateful colonists of New York in 1770 when Parliament repealed the Townshend taxes. 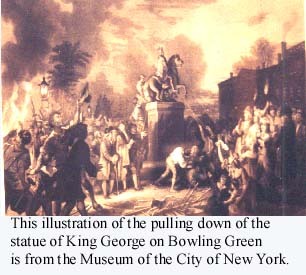 After George Washington had the Declaration of Independence read to the troops on July 9, 1776, people and soldiers headed for the Bowling Green to pull down the statue. They had two reasons for the effort. As an independent nation, they no longer needed a statue of a king. As a fledgling country in the midst of a war with a great power, they needed lead. The statue was made of lead covered with gold. The statue was soon beheaded and broken up to be melted for bullets. In the 18th century, much of the current Battery Park was underwater. Fort George stood just across the street from the Bowling Green and its guns were intended to protect the harbor. The Americans found the fort of little use against the British navy. In 1783, after the British evacuated the city, the Americans fired a 13-fun salute from the fort and raised the American flag, signaling the end of the war. That night, there was a fireworks display at Bowling Green that the local newspaper said "exceeded every former Exhibition in the United States." 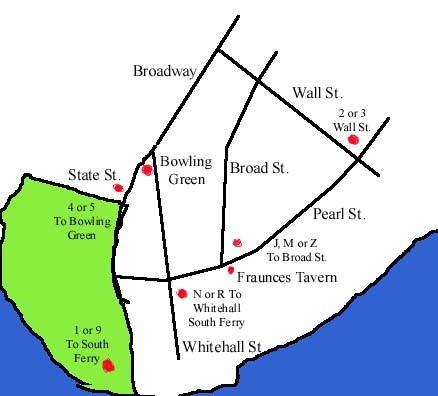 Address: The foot of Broadway, at Whitehall and State Streets.